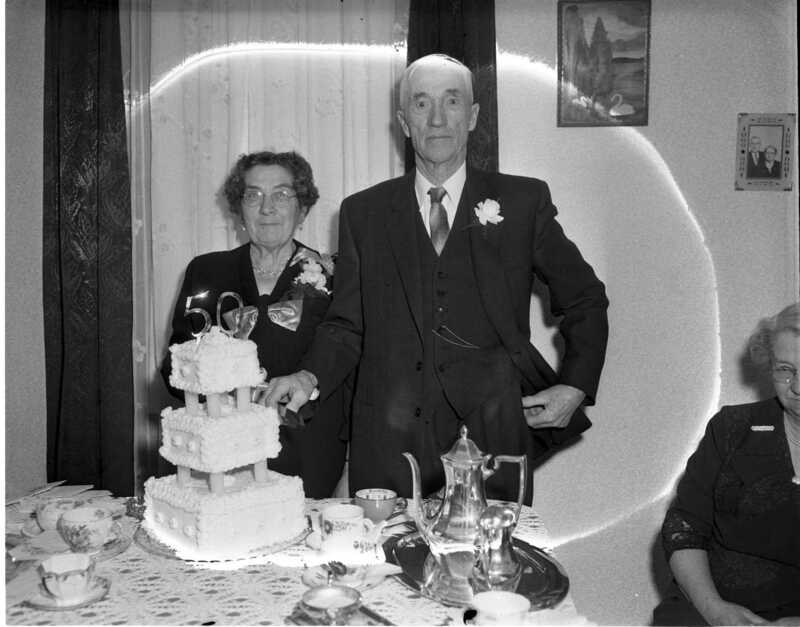 Born within a mile of each other on Concession 1 of Flos, Mr. & Mrs. Thomas Drinkill marked their golden wedding anniversary Tuesday. The celebration was held on the same farm where Mr. Drinkill was born 76 years ago on New Year’s Day. Mrs. Drinkill is the former Peggy Vollick, daughter of George Vollick. There are still Drinkill descendants living in the Waverly area. 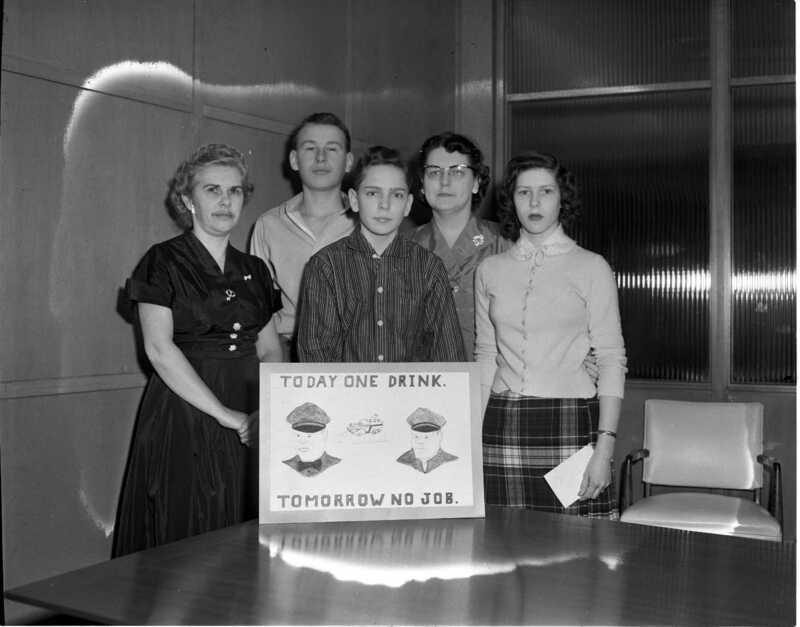 Sponsored by the Women’s Christian Temperance Union, Midland branch, nearly 50 entries were received in this year’s poster contest. Three entrants won local honours and one a county award. 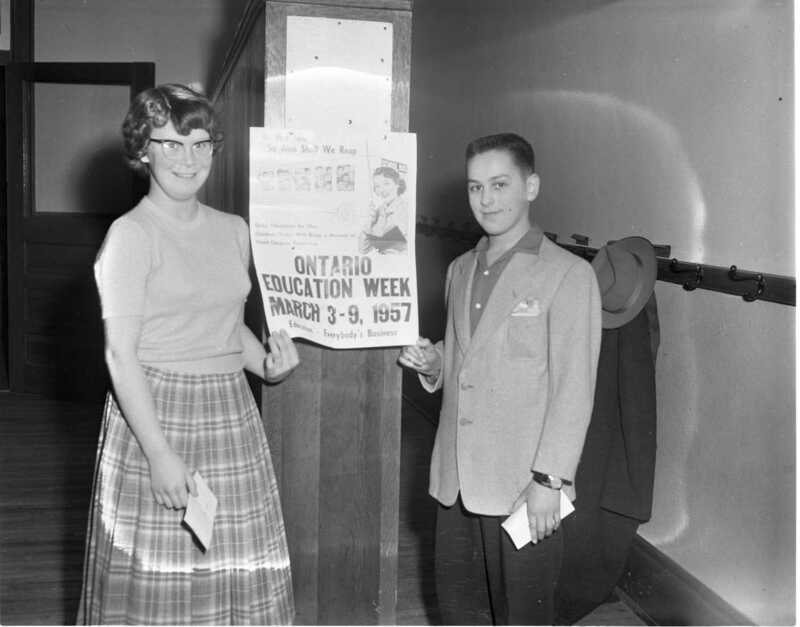 Mrs. C. McElroy, Christian Reban, Wayne Farqhuar, Mrs. W. Farqhuar and Carolyn Bath. 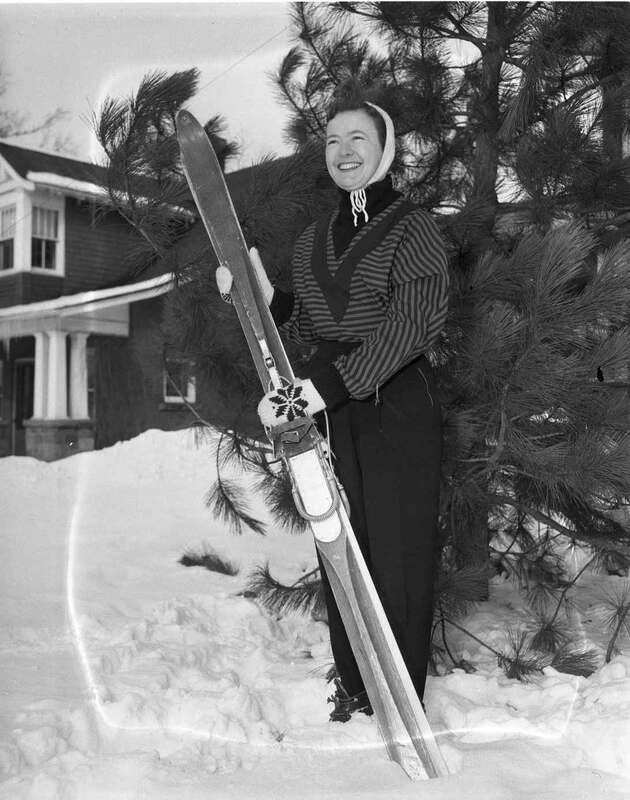 Fashions in ski togs will be featured at a showing in the Parkside Inn Saturday afternoon, in conjunction with the Dominion ski jumping championships to be held in Midland Sunday. The free fashion show will be sponsored by Irving’s of Montreal. Grace Edgar, bottom photo, prepares for the event by trying an outfit from the Wool Shop which features a red and black striped gabardine jacket with black wool trim, and navy worsted slacks. Above, Michael Milner chose another Wool Shop outfit with weatherproof all wool slacks and a pale blue gabardine jacket with matching cap. Ten girls still in the running for Penetang Winter Carnival Queen’s crown are shown at the close of the elimination contest Friday night at the Pen Theatre. 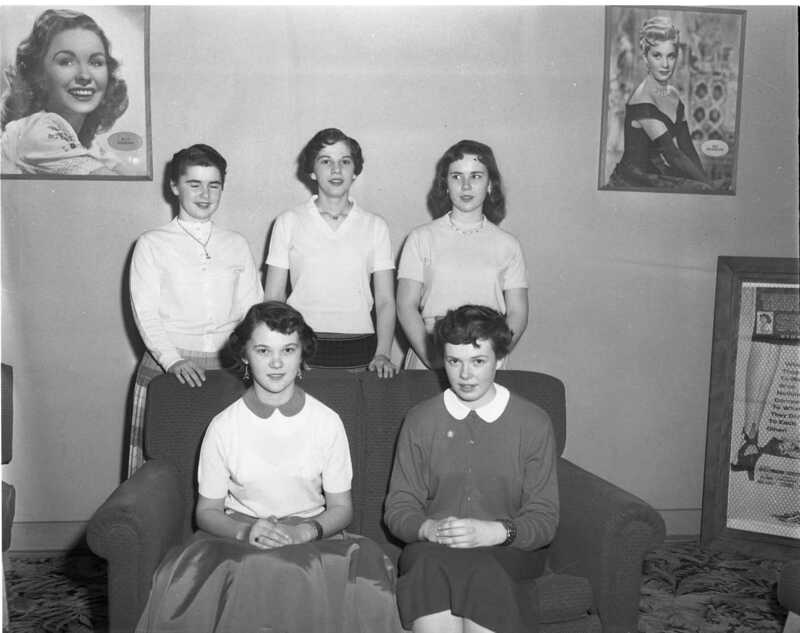 Left to right, standing, Rosita Robitaille, Albertine Maurice, Peggy Couling, Lorraine Lacroix, Anne Dupuis. 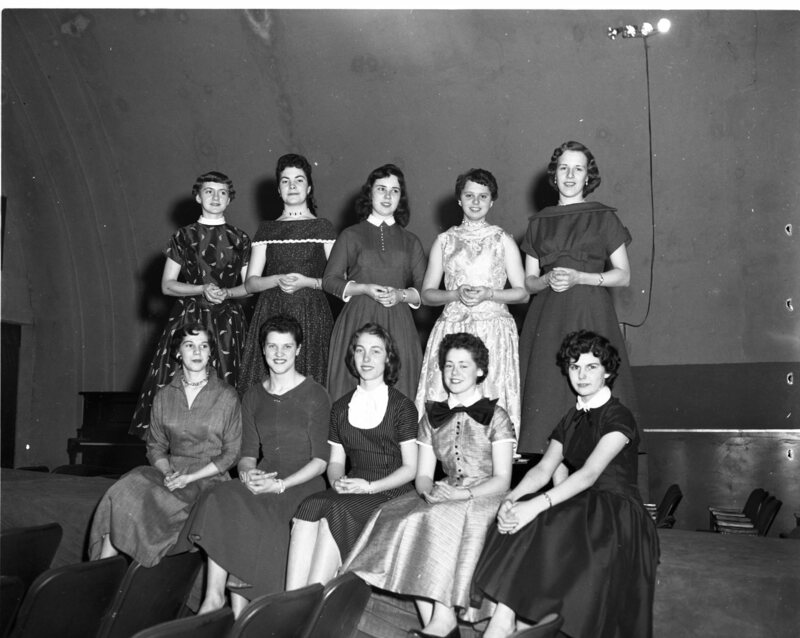 Seated, Sheila Barber, Nancy Somers, Sylvia White, Theresa Moreau, Margaret Butson. Top honours in the Midland Lions Club oratorical contest held at MPDHS last week were won by the four students pictured. They will join two French speaking winners (Donald D’Aoust and Richard Gignac, photo in last weeks post) from the school in provincial finals next month. 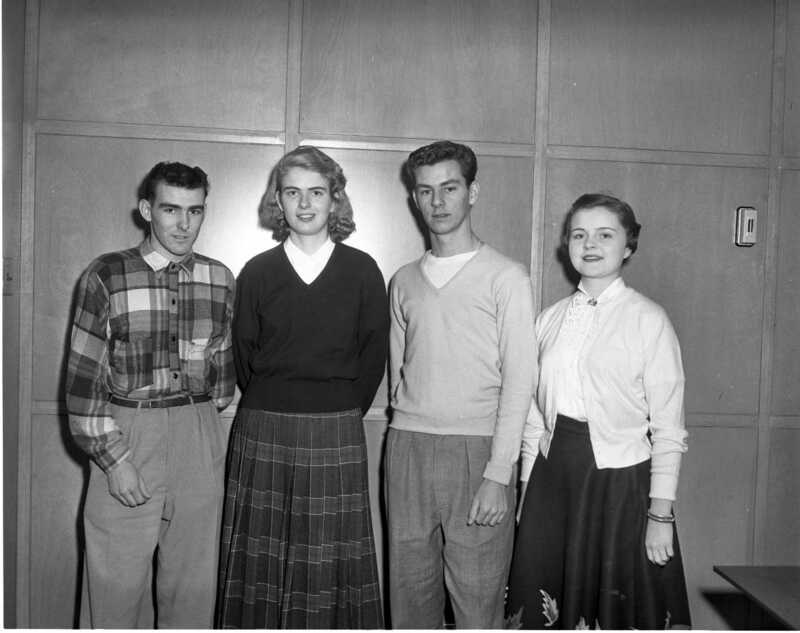 Jim Farmer and Sylvia Sylvey both of whom placed second in their class; and Ken Grant and Betty Binkley, judged top boy and top girl orators. Tests with a new post-hole digger show that it is capable of drilling holes in the ice of Penetang Bay. 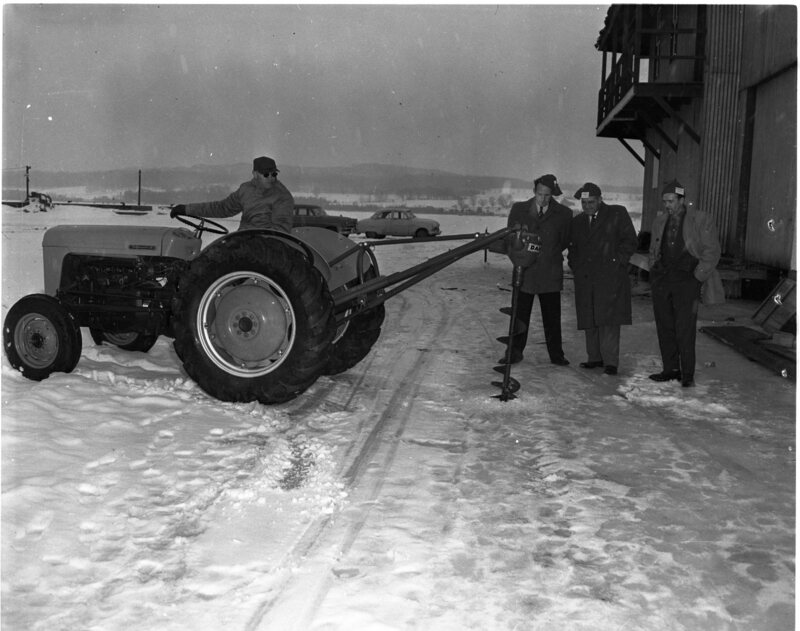 Shown are Mil Starkins on the tractor, Bill Belrose, Marcel Bellehumeur, carnival chairman, and Len Zablotny. So near and yet so far was the case too often Thursday for MPDHS senior girls’ basketball team. Too many shots hung on the rim, as the one above did, and Orillia claimed a 25-19 victory. Although students have a big new gym at MPDHS, none of the school’s five cage teams qualified for playoff action. These lads should be “real handy” around the home when they graduate from the woodworking classes at Midland’s Sacred Heart School. 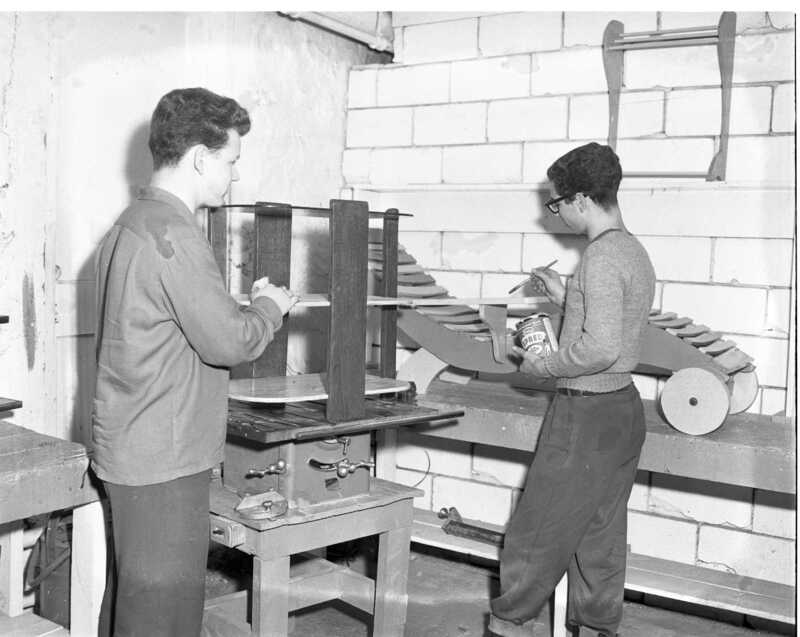 Both in grade 9, the boys are, John Doran, left, and Harvey Boyd. Tables and lawn chairs were on display at the school’s “open house”. Jacques Charland of Trois-Rivières Quebec, has won his fourth straight Canadian senior men’s ski jumping championship at Midland Sunday. 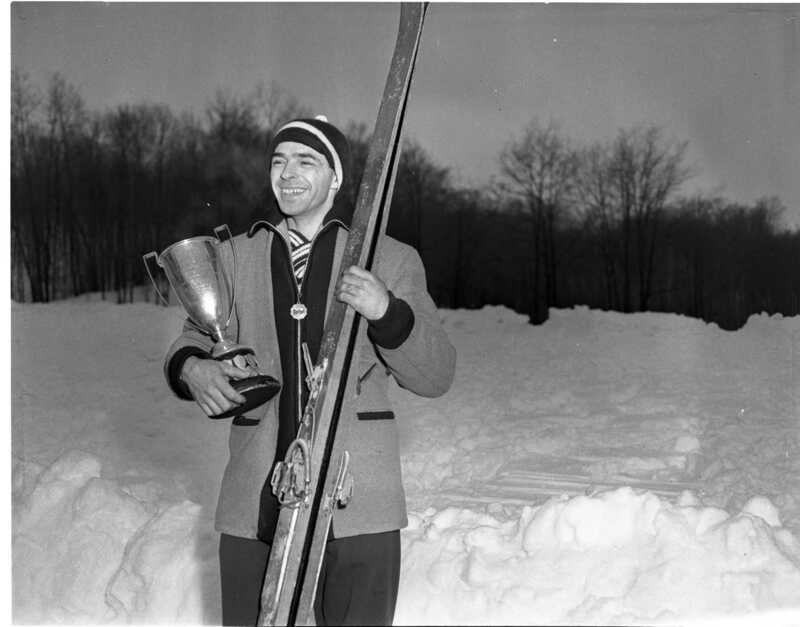 He also set a new hill record of 197 feet, 10 feet more than the previous mark. Freezing rain made things unpleasant for all. This is the season for queens with three being crowned in a two week period. 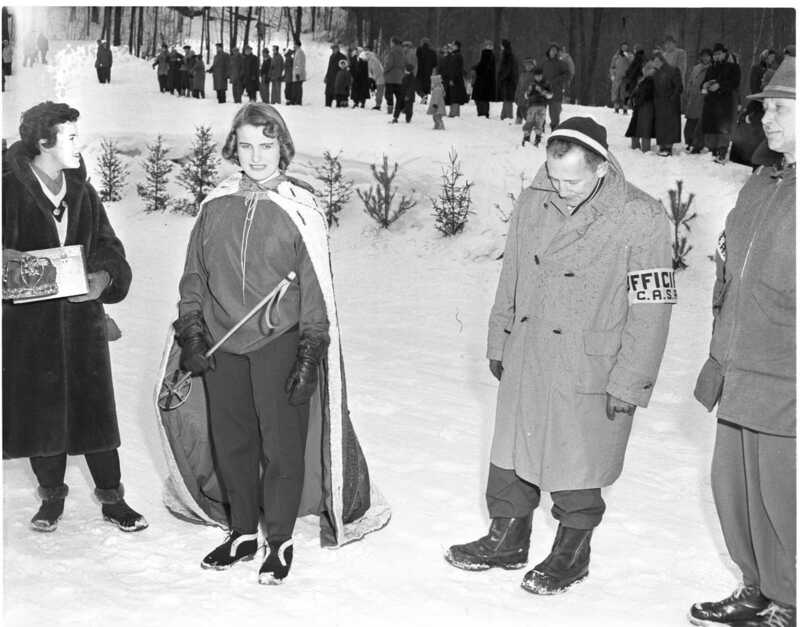 Jutta Keylwerth was chosen to reign over the 1957 Canadian ski jumping championships over the weekend. She is the 17 year old daughter of Mrs. Enya Keylwert of 194 Yonge Street. Jutta received her crown from Mrs. Dave Milner, the former Elaine Gerow, who was last year’s queen. 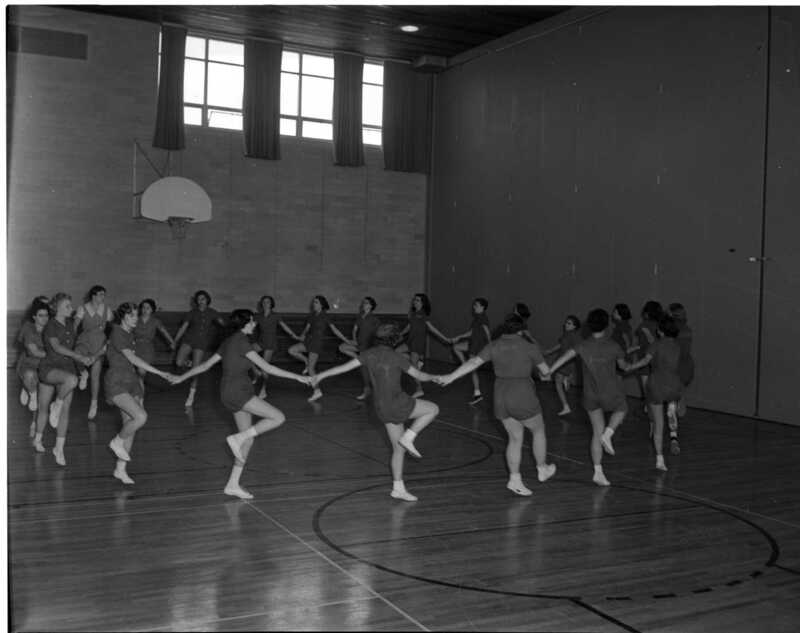 Folk dancing is a popular feature of the girl’s physical education program at MPDHS. 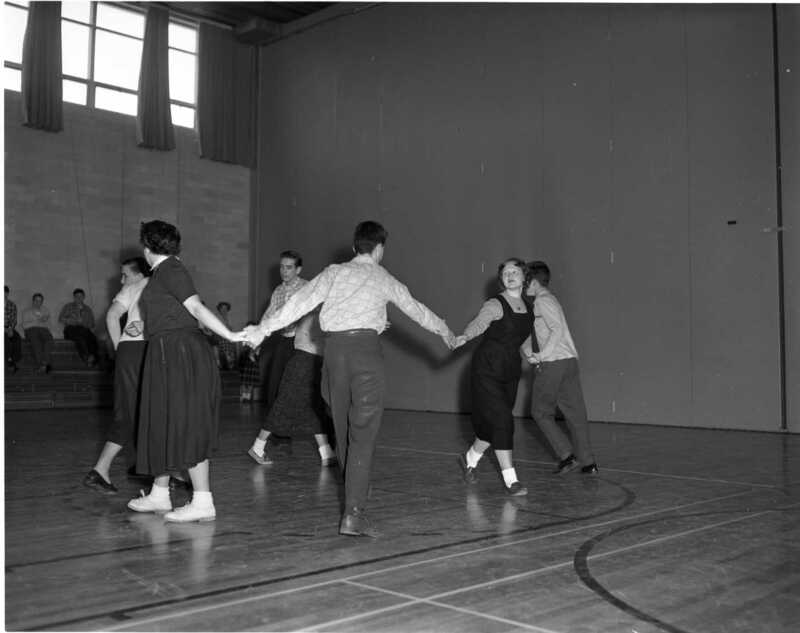 In the photos girls from 12C and 12 Commercial are practicing a Jewish dance called the Mechol Ovadya and traditional square dancing. The Roxy Theatre Trophy is presented annually to the MPDHS boy showing the highest qualities of fellowship, scholarship and sportsmanship. Joseph Huston received the trophy this year during the Queen of Hearts contest Thursday night. 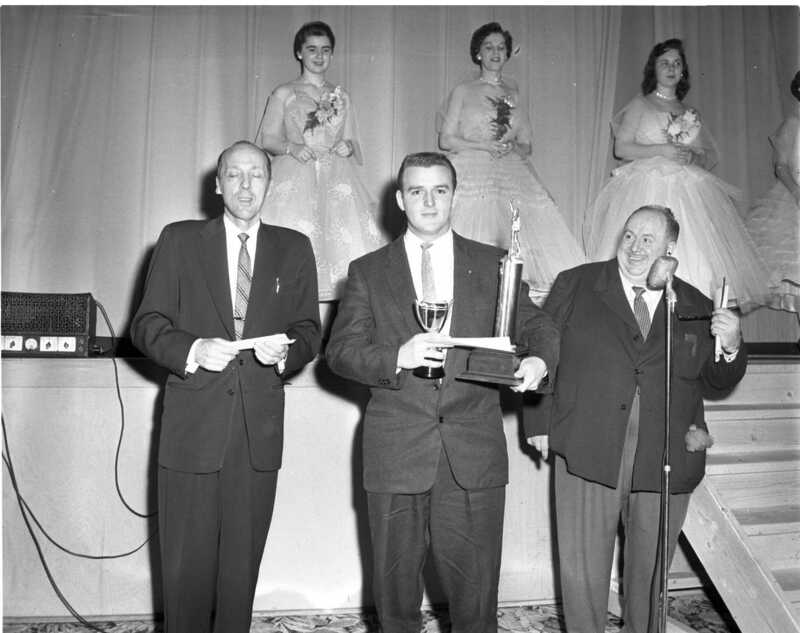 Theatre manager Al Perkins on the right acted as master of ceremonies and Jim Harrison, advertising manager of Odeon Theatres Canada presented the trophy. Winners of the spelling competition in Simcoe County public school inspectorate #1 held at Parkview School, Midland, were Sandra Adam from Port McNicoll and Lieb Shulman of Parkview School. They will compete in the provincial finals in Toronto, part of Education Week in Ontario, March 3-9. 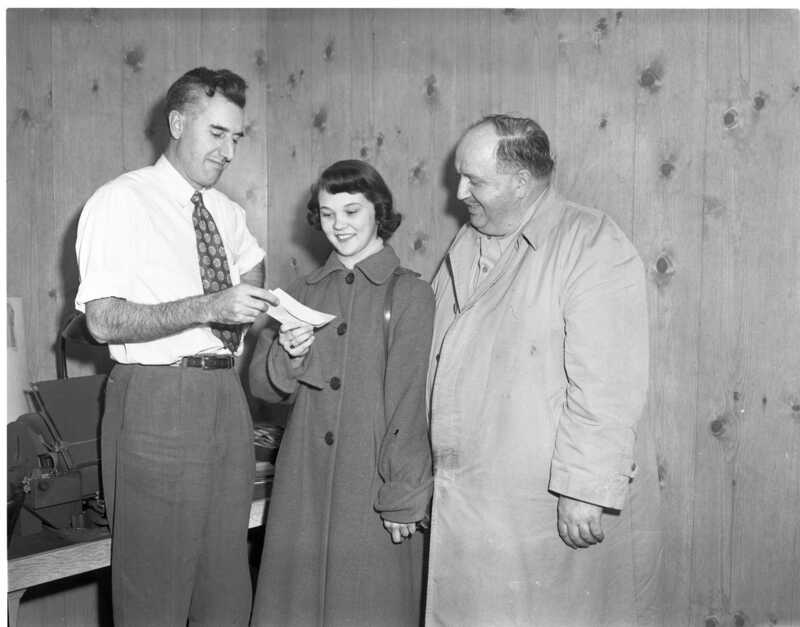 Queen of Hearts, Marita Lalonde of Penetang, receives train tickets and hotel reservations for herself and a chaperone prior to their departure for Montreal Friday. The queen’s trip was jointly sponsored by the Midland Free Press and the Roxy Theatre. Managing editor Wils Harrison on the left and theater manage Al Perkins. Brown haired and brown eyed, 17-year-old Marita is the new “Queen of Hearts” of Midland-Penetang District High School. Fifth youngest in a family of 13 children, Marita bested four other contestants in the finals held at Roxy Theatre last night. The Ladies of St. Ann, Penetang, plan to use money earned from catering for a banquet to purchase new pots and pans to add to the modernized kitchen in the church basement. The banquet was served to some 200 members of Knights of Columbus in Laboreau Hall. Tables were decorated with snapdragons and daffodils. (From the editorial page “Wise & Otherwise”) The town council of Orillia is to be heartily commended for its acquisition of the Brewery Bay home of Stephen Leacock, the manuscripts and books therein, and the other valuable artifacts which have linked that famous humorist to Simcoe County. This is outstanding example of civic enterprise in the field of historical conservation. Particular congratulations go to Orillia Alderman Pete McGarvey who has played no small role in this project. Obituaries – MRS. A. BENSON, a resident of Midland for 55 years, Mrs. J . A. Benson died Feb. 2 in St. Andrews Hospital. She was 76. Rev. J. L. Self conducted the funeral service held Feb. 4 at Nicholls’ funeral home. Pallbearers were James Brechin, Doug Strathearn, J. W. Smith, James Playfair, Lorne Richard and Harry Creates. Dr. John McNab conducted, a service in Toronto, and burial was at the Necropolis, Toronto. Mrs. Benson, the former Mary Mabel Bowman, was born April 20, 1880, at Plainville, where she and James Albert Benson were married in 1902. A member of the Presbyterian Church, she was past president and a life member of the Women’s Missionary Society and a member of the Women’s Auxiliary. 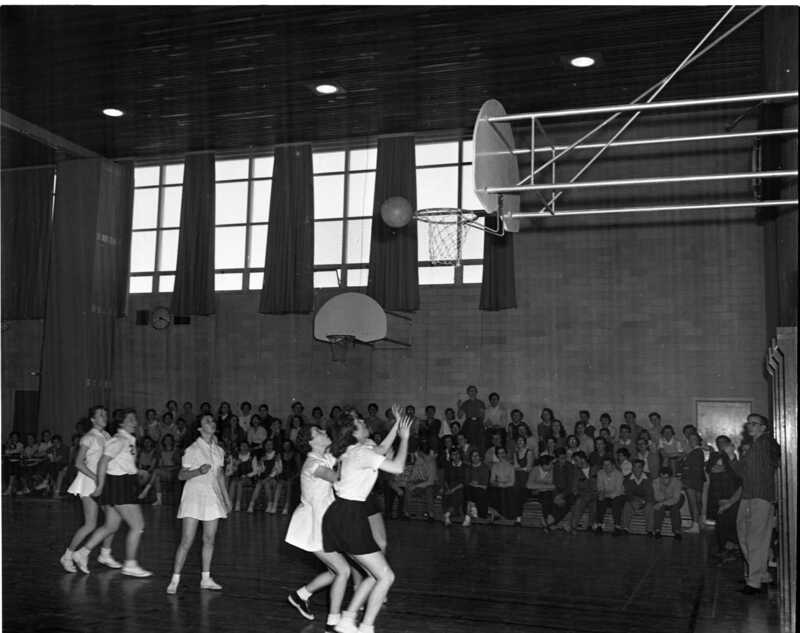 She was also a member of the YMCA Auxiliary. Surviving are her husband, Orma of Toronto, William of Acton, Harold of Midland, Mrs. H. A. Creates (Donna) of Willowdale. Sisters are Ella (Mrs. O. D. Barlow) and Ethel, (Mrs. M. J. (Brechin), both of Midland and nine grandchildren. —–BENJAMIN HENRY MOREAU died Feb. 5 at St. Andrews Hospital, of a coronary thrombosis. Rev. J . S. Howe officiated at the funeral service held at St. Mary’s Church, Victoria Harbour, Feb. 8. Temporary interment was at St. Ann’s mausoleum, Penetang. Pallbearers were Wilfred Bourgeois, Andrew Larmand, Willard Larmand, Dudley MacPherson Gough, Joseph Rooking and Raymond G. Souch. Born in 1926 at Victoria Harbour, he attended school there. 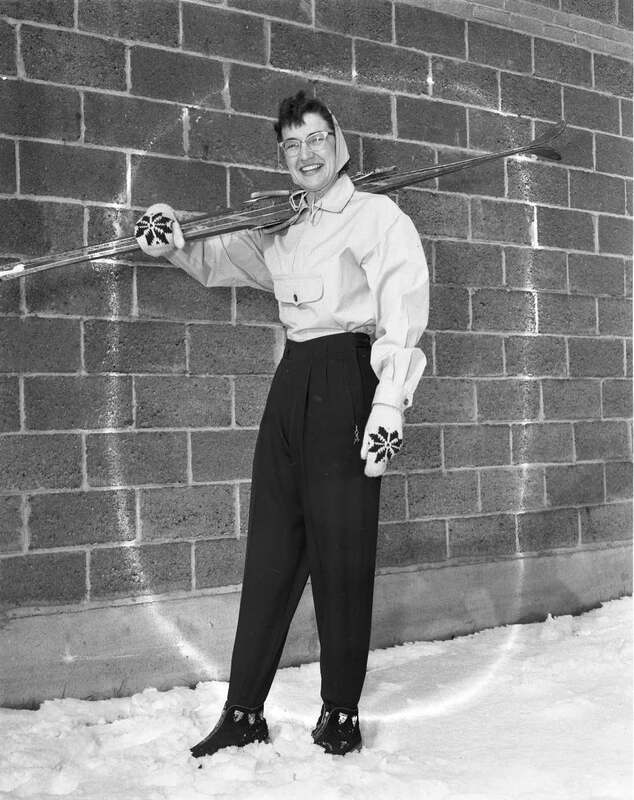 He and Felicia Doherty were married in Toronto In 1947. Mr. Moreau was a member of the Roman Catholic Church. Surviving are his wife and children Nora, Felicia, Dawn and Colleen. His parents, Mr. and Mrs. Philip Moreau, also survive, along with seven sisters, Mrs. Wilfred Bourgeois of Victoria Harbour, Mrs. Andrew Larmand of Victoria Harbour, Mrs. A. Belanger of Coniston, Mrs. W. J. Moreau of Victoria Harbour, Mrs. A. Ionish of Toronto and Mrs. Martin Forgie of Toronto; and five brothers, Geoffry, Lawrence and Tony of Victoria Harbour, Raymond of Midland and Thomas of Owen Sound. TEN YEARS AGO THIS WEEK —- New officers for Penetang Kiwanis Club were installed. Officers for 1947 were Edgar Moreau, president; W. D. Duncan, vice-president; Bruce Stephens, treasurer; George Bryant, secretary; Dr. B. A. Blackwell, Douglas Hunter, R. S. Gauthier, Francis Light, W. H. Hewson, W. M. Thompson, Charles Smith, directors. —- Worst storm of the season swept Ontario, blocking roads between Midland and Toronto. Several Midland and Penetang citizens who had spent the weekend in the city were unable to return home Sunday night. Toronto bread trucks did not get through until Tuesday morning, when roads were opened. —— One-quarter of Midland’s primary and secondary school pupils were confined to their homes through an epidemic of influenza. Pupils in Penetang schools were not as severely affected by the epidemic. —– The Ontario government had approved a grant of $5,000 for archaeological excavations and investigations in Huronia. Further studies were to be made by Royal Ontario Museum staff members near Warminster and at the Huron Ossossane ossuary in Tiny Township. —– Exploratory moves were under way to establish a joint district high school for Midland, Penetang, Tiny and Tay Townships, Port McNicoll, Victoria Harbour and Waubaushene (MPDHS). —— Abe Moses, prominent Penetang businessman died. His first business venture was the old Georgian Bay Hotel, Penetang, which burned in July, 1926. Hunting and horses were his two main interests. From the editorial page “Wise and Otherwise”; The Ottawa Liberal administration spent $900,000 of Canadian taxpayers’ money last year to buy several European paintings, this at a time when $100 million is being set aside to subsidize the arts in this country. Consistency, thy name is not always politics. High School boards, throughout the Georgian Bay area are facing a battle on behalf of ratepayers with a teachers’ organization that is demanding major salary increases for 1957. To the Midland – Penetang District High School Board, the local unit of the Ontario Teachers’ Federation has presented wage demands which call for a boost of $600 a year for non-specialists; $1,000 a year for specialists; and $1,400 a year for department heads. On top of this the teachers have asked that the annual guaranteed increase be boosted from $200 to $300 a year, by 50 per cent. Present annual minimum salaries for the 29 secondary school teachers in this area are as follows: Present and Demanded for Non-specialists $3,400 -$4,000 Specialists … $3,600 – $4,600 Department heads $3,800 – $5,200. 155 more telephones connections in Midland in 1956, current total number of subscribers is 3,100. Simcoe Countie’s population has increased by 20,000 in the last five years, now at 127,000. The late fifties saw the advent of the home freezer and the electric clothes dryer, both are being heavily advertised in the local paper. 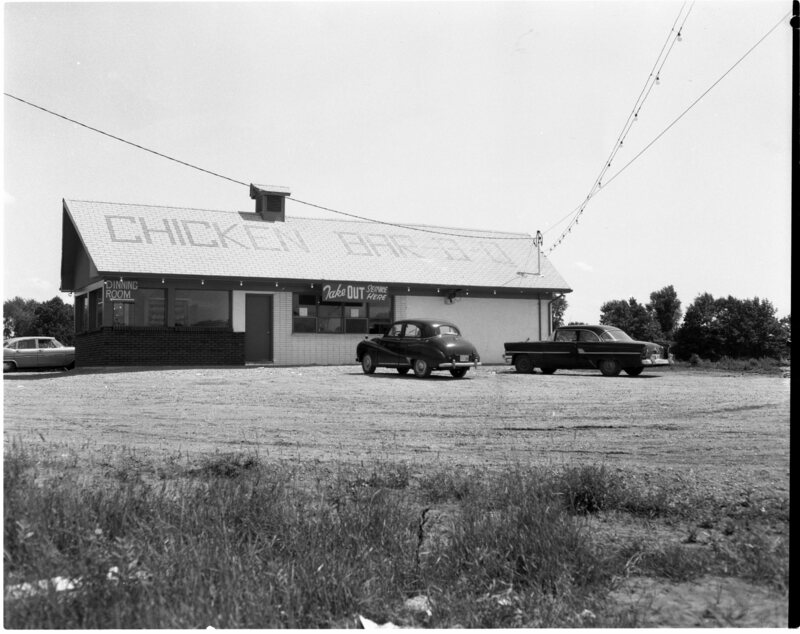 There has recently been a discussion thread on the local historical web pages regarding Haugen’s Chicken BBQ that was located on the south side of Highway 12 just before the CNR overpass. We have found a photo of that restaurant in the museum files and include it here.